Buy Lifemiles 100% Bonus Purchase Promotion!!! This month has some great promotions to buy miles including the upcoming 100% US Airways Share Miles Promotion. 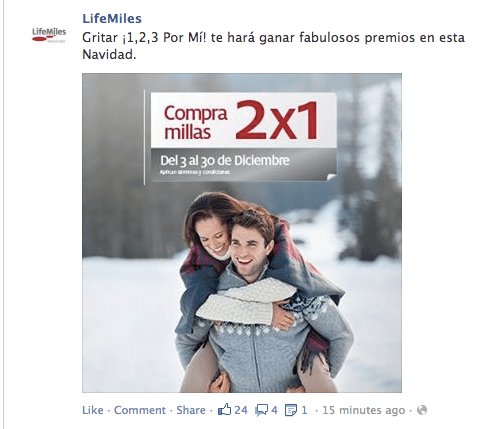 It seems that lifemiles will also be launching a 100% bonus starting December 3, which came up on their facebook page today. (like me on facebook!). This promotion is now live! The promotion runs December 3th to December 30th. The maximium number of miles you can purchase during the calendar year is 150,000. Miles are sold for 3 cents apiece. This means a 100% bonus would make each mile around 1.5 cents to purchase. 10,000 miles would cost 150 USD, with no additional taxes. If you have never purchased lifemiles, there are several things to keep in mind. First of all, the call center is atrocious, so in essence you can only book redemptions which are shown online on lifemiles.com. Of course, their online search engine is also awful, and will not show mixed class itineraries nor itineraries with long layovers, so keep that in mind if you want to buy lifemiles. Stopovers are not permitted on awards without raising the cost of the redemption, so you’re best off doing one-way redemptions. Finally, you can also use cash and points when making a redemption, with the best value being using 50% of miles and 50% of cash. As always, I do not recommend hoarding, but if you do purchase lifemiles for future use you’ll only need 50% of the miles required, and you can top up when actually redeeming. The lifemiles award chart is here. You can multiply the cost of the award by 1.5 cents to get a sense of how much each award will cost.If you’re purchasing with a 100% promo, a 25,000 mile award costs $375 to purchase miles. Previously, I’ve been hesitant about whether to buy lifemiles, because they’ve had a history of devaluing the chart without notice which I’ve written about here and here. This time though, I definitely will be taking advantage of the promotion, because there are incredible redemptions to be had and new amazing awards that I find everyday. Outright buying miles means Lufthansa First Class for under $800, and TPAC and TATL business class flights for under $400, which is pretty incredible. I’ve burned well over 230k Lifemiles and it’s been a fanstastic value for me. I don’t get how you figure the $800 for Lufthansa first class? is it for short haul? I must did something wrong. I tried to purchase 33K for $900 but couldn’t input the 2*1 mile. You have to be registered before the promo started. Please note that Lifemiles has increased the price of the cash part in cash+miles redemptions. Now the cash rate is never cheaper than 1.5 cents/mile, in most cases higher (it’s no longer a fixed rate, either). The “flex” miles still come to cost $15.76 per 1000 so much better than the usual price of $30/1000 but now with the promotion is may be actually cheaper just to use miles as with 2×1 you’re really buying them for $15/1000. That’s why I said 50%/50% gives 1.5 cents. When you buy at 50%/50% that’s the best ratio to buy miles at it’s 1.5 cents instead of 1.576. I really want to buy, but I travel with a small kid and have to check bags, so it’d be tricky for me to maximize this program. Sigh. I need to fly to Chile in April from NYC and am seeing availability in saver economy on United.com for an Air Canada flight (60k miles round trip), however when I search on Lifemiles.com it comes up as sold out (I selected Air Canada as the search option, otherwise it only brings up an Avianca flight for 108k miles round trip). Am I doing something wrong? Yes, that is a bit annoying, but basically, for routes served by Avianca/TACA the search automatically jumps into Avianca/TACA award space. To avoid that, you need to either select a specific airline or “Star Alliance” as the “prefered carrier” <– that's actually misspelled on the site. @david not sure why it is difficult to check bags. Can you relay the issue. Also is there any better availability on Lufthansa with life miles (vs UA)or is it the same short notice travel for first/biz?